The little project I'd like to show you this week is one I completed some time ago. I thought I'd show you now because you might have some postcards you collected over the summer. 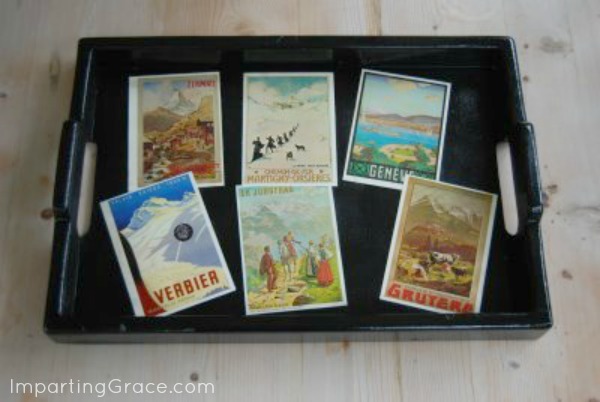 This is a fun way to use those postcards and preserve your vacation memories. Last year we got to go on a special trip. At the time, my husband was working for a Swiss bank. He had to go to Switzerland for business, and we got to tag along. Now, if you live in a hot, sticky climate like the one we have in North Carolina, you'll jump at the chance to go to Switzerland in August. Believe me. Most of the items we would have liked to purchase as souvenirs were very expensive, so we didn't buy very much. But we did purchase a wonderful vintage travel poster (well, a reproduction) from the town we visited and a stack of pretty postcards. The poster I framed in a traditional Swiss style. I love it. Now we have a very useful serving tray that serves as a fun reminder of our trip every time we use it. Check out all the fun projects at Kimba's! cute idea. I saw a project with Christmas Cards. This is such a great idea! Fun to see a project I haven't seen yet in blog land. That really turned out beautiful! So fun and such great memories all in one. Seems like I never have time to comment - busy summer - but I've been keeping up with your posts. Great idea! That turned out great. Blessings! This looks fabulous! Great idea! that is a great idea! i have done that with actual photos of my kids (for Christmas gifts)but i never thought of using the post cards that way! thanks! What a great job you did - makes me want to do another tray! What a great idea! That is too cute. It looks so cute! It looks like something you would see in a magazine! and p.s. great idea of how to use the postcards! too cute! That's a really cute idea! I have a box full of old postcards from past trips. I never could think of anything to do with them. I'll be digging out some postcards!!! Very cute idea! Every time you use your tray you'll have a reminder of your travels!